Adoration Manager is a web service. The program is hosted on our servers and accessed over the internet using 256-bit SSL encryption. No desktop software is required other than a standard web browser. Nearly all web browsers are suported, including Microsoft Internet Explorer, Mozilla Firefox, Google Chrome and Apple Safari. Some chapels use good old pencil and paper to manage their adoration schedules and adorers. Others use spreadsheet software. While these methods work, they are missing several important functions -- automation, communication and reporting. 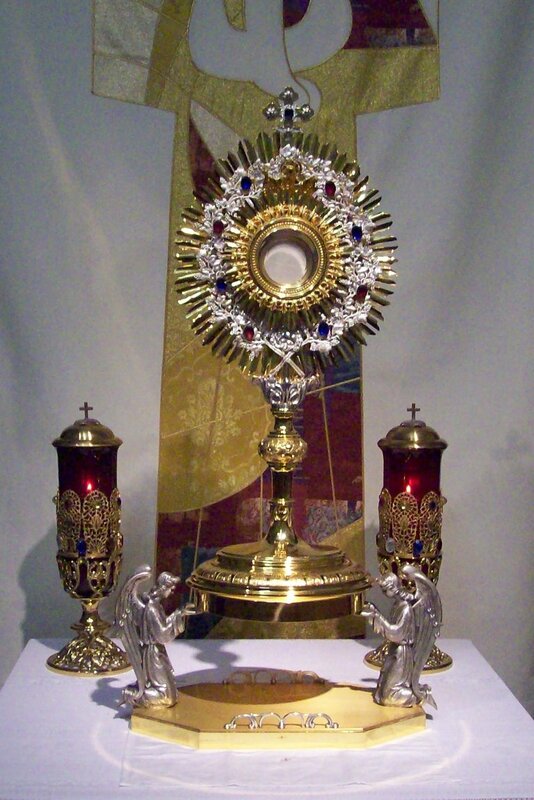 While Adoration Manager was written to make managing adoration chapels simple, the technology behind the system uses enterprise-class server software and databases to make the complex task of managing an adoration chapel greatly simplified. Adoration Manager is capable of managing and scheduling hundreds or even thousands of adorers while at the same time making full use of E-Mail and TXT messaging to keep everyone informed when changes occur. Tasks that would normally be tedious and time consuming, such as compiling and emailing reports and notifying people of changes, are all automated. Perhaps the most tiring task used to be collecting the paper sign-in sheets from the chapel, interpreting the handwriting found there, and manually marking attendance of the adorer on an attendance sheet. This entire process is completely automated with the use of a simple, intuitive and friendly touchscreen in the chapel (or vestibule). Sign in as an Adorer, Substitute or a visitor! The sign-in touch screen is a simple but powerful tool that allows adorers to sign in for their hour, subsitute for other adorers or just sign in as a visitor. The elderly even enjoy using the touchscreen because it lets them feel like they are not only using technology, but, more importantly, they feel empowered and involved! So easy, even a caveman could use it! 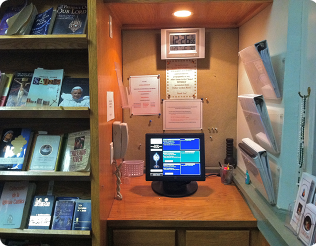 Usually located in or near your adoration chapel, the touchscreen allows adorers to view schedules (including group schedules), contact information for Division Leaders, Hour Coordinators and more. Because adorers sign in using their unique 6 digit Adorer ID, automatic daily attendance reports are generated and emailed to pertinent staff persons so problem areas can be quickly identified. Note: The term 'admins' below refers to Division Leaders, Hour Coordinators and System Managers. Does not use a keyboard or a mouse! Operated and navigated by simply touching the screen. Completely automates the task of maintaining the sign-in log. Adorer schedules, substitute lists and contact numbers are easily accessible. 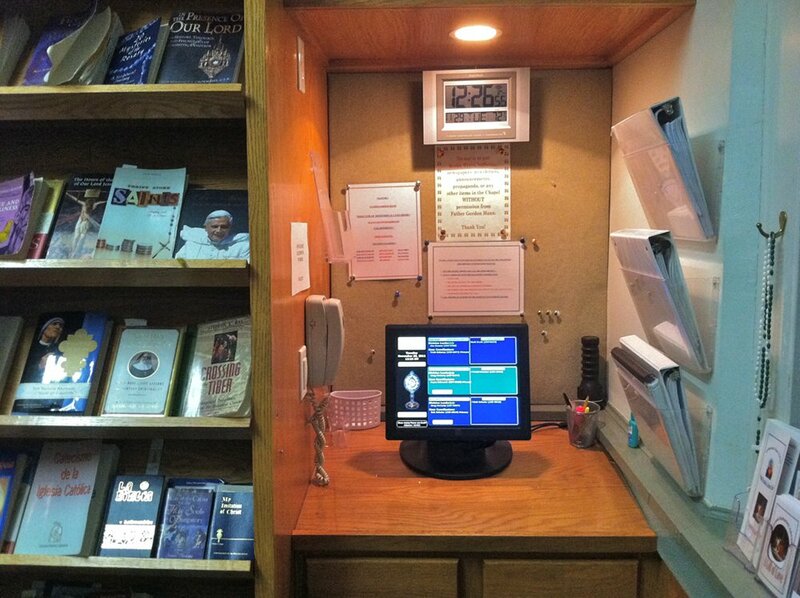 Eliminates the need to hang paper schedules and contact info in the chapel. Easily indicate Repose/Cover of the Host in the case of absence. Adorers are assigned a unique six digit ID they use to sign in on the touchscreen. Adorers can elect to receive reminder emails/TXT messages for their hours. Adorers receive a printed welcome sheet via email detailing contact information and their ID. Welcome sheet can also be printed for mailing to adorers who don't have an email address. Groups of adorers (share responsibility for one hour) are easy to create and manage. Groups are a great way to introduce adorers who are unable to commit to a regular weekly hour. Full-featured recurrance system allows adorers to choose hours like '2nd Thursday of every month'. Allows administrators to easily see where Open Hours are. Easily add or remove regular adorers and groups. Easily view the sign-in log and make corrections as needed. Detailed daily attendance report is emailed to all admins for accountability. Weekly Schedule can be emailed to all admins. Weekly Substitute List is emailed to all admins. Sends E-mail to affected adorers and admins when someone is added/removed from an hour. Easily manage reminder E-mails and/or TXT message reminders for any adorer. Automatically maintains a list of Open Hours (hours needing to be covered). Emails list of Open Hours to all administrators every Monday morning. Automatically E-mails Groups and Group Members their schedule once a month. Fully multi-user capable with logins having multi-level access through the use of roles. Manageable from any internet connected PC or Mac with a secure browser. Software is hosted at a telecommunications provider with double power redundancy. Uses industry standard 256-bit SSL encryption for secure internet communications at all times. System backups are taken nightly and kept for a minimum of 30 days. All software upgrades and fixes are included in the service fee.